35th Golden Joystick Awards announced for November. 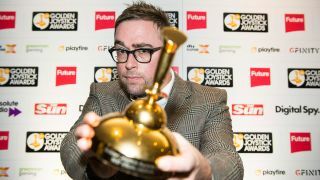 Danny Wallace hosting; YOU decide who wins the awards! It's the biggest publicly-voted video game awards ceremony on the planet. The Golden Joysticks is back for its 35th year, with the actual ceremony set for November 17 in London. Danny Wallace - actor, comedian, writer, and the voice of several well-known gaming characters - is on board to host the awards too. And you can watch the whole thing wherever you are via Twitch, our official streaming partner. Here are some key dates to watch out for, so mark them in your calendars. The shortlists for each award will be announced on September 21, so you'll be able to start voting for all your favourite games right then. Voting will close on November 3, before the actual winners are revealed on November 17. Got all that? Don't worry, we'll remind you, and there won't be a test. "I'm delighted to return to host the legendary Golden Joysticks, and to find out what the gamers themselves think are deserving of the industry's most undeniably golden awards," says Wallace. Last year, the big winners were Dark Souls 3 (which scooped Ultimate Game of the Year 2016), Overwatch (which won Best Original Game and Best Multiplayer Game), and Titanfall 2 (which won the Critics Choice Award). Here's a full list of the 2016 winners and categories. Want your fav game from 2017 to be in with a shout of scooping one of those coveted gongs? You'll need to get voting on September 21.